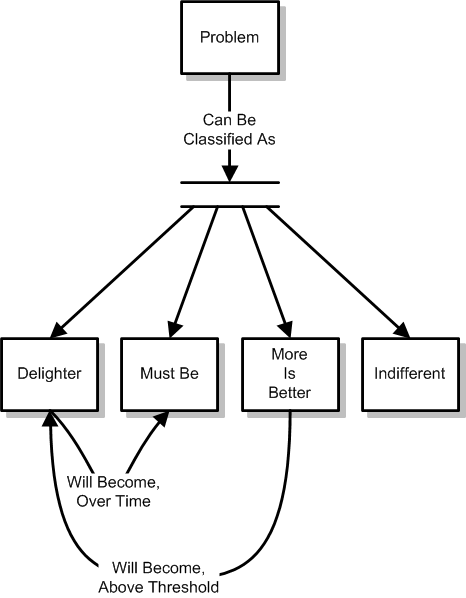 I’ve been developing a model for describing markets that emphasizes the critical customer-centric perspective that product managers need to have. This article is a first draft of that model – I’m sharing it here in hopes of getting feedback to improve the model and my approach for communicating it. Provide a framework that helps product managers make decisions about products. Establish an outside-in bias that encourages product managers to think first about customers and second about implementation. Encourage teams to design products that solve real problems that people will pay to solve. Support both Agile and Waterfall development processes. Please comment below (or privately) with any feedback about the model or presentation thereof (both prose and graphics). Thanks in advance! Market segments are traditionally defined based on aggregate data that makes it easy to operationally address groups of customers. Business-to-business (B2B) and business-to-consumer (B2C) markets are typically divided using the same approach, with a few data sources that are uniquely relevant for each type of company-to-customer relationship. NAICS Industry Definitions – A standard taxonomy for defining the different businesses in which your customers engage. Demographic Data – For companies, this can be number of employees, annual revenue, corporate structure, or other characterizing metrics that are relevant to your product. Transaction History – The history of purchases by the company. Absolute magnitude, frequency, and recency of purchases can all be used. Geography – Where a particular company is located. While not always correlating with variation in companies, it may serve as an effective way to “split the work” for internal organization – such as geographic sales teams. This type of segmentation can also help when business rules or policies vary by geographic region – such as tax, policy, and other legal variations that apply either to your company or your customer. Demographic Data – For consumers, this can be household income, age, or other easily measured and aggregated characteristics. Transaction History – As with B2B segmentation, the history of purchases by the consumer is considered. Frequency (loyalty), recency, and absolute magnitude (lifetime customer value) of purchases are all usable. Geography – Geography can be used for B2C segmentation in the same way that it is used for B2B products. A designated market area (DMA) represents a region of customers that would receive the same broadcast messages, and companies sometimes organize their customers by DMA . Third party companies also provide geographic segmentation based on patterns of similar demographic data that can be statistically associated with a given geography. 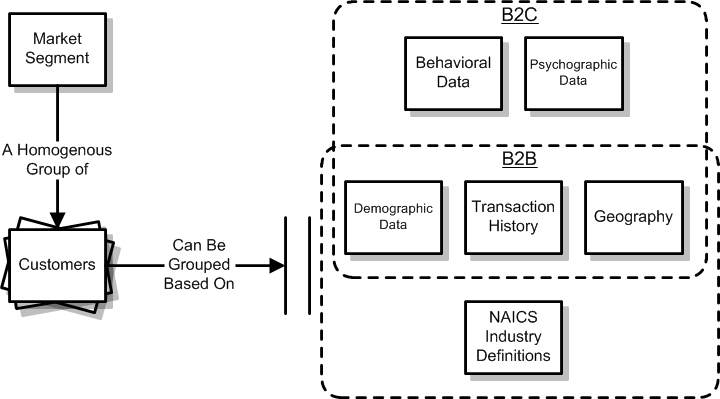 Behavioral Data – As an ecommerce company, you can measure and study the specific user actions of customers on your website, correlate those behaviors with transactional actions, and define groups of customers that “behave the same way” in order to customize their website experience, offer targeted promotions, and otherwise organize engagement and reporting. Psychographic Data – Customers that consider purchasing your product for similar reasons; customers who have similar backgrounds, experiences, and perspectives; and customers that share user goals are commonly identified as personas. These personas are archetypes that represent groups of customers. These groupings can be used to segment your market. The term customer is ambiguously applied to both buyers and users, and is only accurate when it represents someone who is both the purchaser and the end-user of your product. You should explicitly think about your customers as buyer personas and user personas. Buyer personas compare products based on their suitability to solve the problems that the buyer perceives as valuable. User personas value products based on how effectively the products solve their real problems. This is the most important distinction between buyers and users, while both are focused on value, only the end users will realize the value directly. Market research should be focused on developing personas that represent homogeneous groups of customers, so that you can focus on the problems that each group distinctly faces. Problems to be solved for the groups of customers that make up your market segments are what define a market. Kano analysis provides you with the tools to classify these problems, allowing you to make informed decisions about which problems to focus on in your product roadmap. Kano analysis, as originally defined, classifies products in terms of the features or capabilities they provide. The naming originally used by professor Kano (as translated) is slightly different than the terms used above. The change in terminology here provides more clarity, particularly when applying Kano analysis from a market-perspective (outside-in) versus a feature-perspective (inside-out). As a market-driven product manager, you should tweak the language of Kano into classification of problems and solutions, because customers value solutions, not features. All of the techniques of Kano analysis apply, the nuance of this approach is to refocus on problems (outside-in) not features (inside-out). Delighter – A solution to this problem will delight your customers. As markets change over time, customers lose their sense of delight, and come to expect solutions to previously solved problems. Must Be – This problem must be solved by your product, or your prospective customer will refuse to buy or recommend it. More Is Better – This is the classic shades of grey problem, in contrast to the black and white nature of a must be problem. Solving part of this problem is good, solving more of it is better. The easiest way to think of this problem is that solutions are partial solutions, and the greater the portion of this problem your product solves, the more satisfied your prospective customers will be with your product. Indifferent – This is a problem for which your customers are indifferent to the solution. Buyer decisions about purchasing your product (versus the competition) are not affected by how capably this problem is solved. Users will not judge your product’s effectiveness based on how well it solves this problem. Gain more insights from competitive analysis. Prioritize the content of each release to grow (revenue or profits or market share) faster. Design solutions that particular groups of customers will love. That pretty much describes the model. Please share feedback below (in the comments section) or offline. Scott, excellent post, as always. One of things I often hear about product managers is they often miss the connecting points with customers and markets. The market model you’ve described is a nice personal roadmap for product managers who don’t have a heritage that’s sales oriented. There’s been a lot of debate about “where” the best product managers come from. Is it a technical heritage or sales/customer? As someone who started in sales engineering and moved into product management, I’ve found I have a better discerning ear and a foundation in place to adapt those skills that are customer-oriented. •Provide a framework that helps product managers make decisions about products. •Establish an outside-in bias that encourages product managers to think first about customers and second about implementation. •Encourage teams to design products that solve real problems that people will pay to solve. •Support both Agile and Waterfall development processes. All of the attributes and/or actions in the model align themselves with the customer and market-orientation that product managers need. One of the things I know ALL product managers need to do is better communicate from the user and buyer perspective. While many teams have adopted Agile in some form, many have not and miss the opportunity of uniting user stories, personas and communications with the market and customers willing to “pay for solutions” that delight. Since I have a “technical heritage”, and had to learn this stuff (thankfully, a lot of it while I was still coding), it is super-useful feedback to know that this model resonates with you. As the buyer, you’re making decisions based upon the problems you think are important to solve. Later, as a user, you’re making judgments based on the problems it turned out were actually worth solving. Thanks all for the great points and conversation – keep it coming! Thanks Justin! That’s a great link. I was doing QFD stuff back in the day when I was still an engineer, before I got into software. I’ve always felt like QFD has relevance to product management. Now I’ve got a good, current, reference to look at and start thinking. Perhaps there’s a “QFD for Product Managers” article in the future :). Thanks, Maggie! Great insight that understanding your users’ needs while others are still worried about the short term “close the sale” issues with buyers can help really differentiate your product and help you win in the long run! The outside in approach is very intutive. Very logical approach to the important distinction between Buyer and User. The One point to note is while understanding market, the product managers need to take into account how the company is planning to improve it source of volume and correspondingly segment markets. Can you tell us a little more about what you mean by “improve it source of volume?” Not sure I understand. Thanks also to the folks who’ve sent me feedback offline so far! Source of Volume is the understanding of WHO will purchase the Company’s product and WHY they will do so. The source of volume delas with attitudes and behavior of customers with regards to company products and the competition and the strategy to create winning products in the market place either by stimulating demand or by steal share strategy. Market Segments for product development should align with the strategy that is defined by the company to improve its product position. For example a company may decide to develop products to increase source of volume by demand, in that case the market segmentation should be cognizant of the fact that, the developed products are attempting to garner a larger customers’ mind share. Since there is so much positive feedback on your post, I think you know you’ve got slam dunk points here. One piece of feedback I have (not sure if others agree with me), is I found it a bit difficult to follow along and make some of the connections you want me to make as a reader without doing a lot of re-reading/thinking. Not a big deal, but if you eventually want to translate this into a presentation or such, you might think about how to connect the dots a little more smoothly. Appreciate the feedback, definitely helps! Hi would you mind stating which blog platform you’re using? I’m looking to start my own blog in the near future but I’m having a hard time deciding between BlogEngine/Wordpress/B2evolution and Drupal. The reason I ask is because your design and style seems different then most blogs and I’m looking for something unique. P.S My apologies for getting off-topic but I had to ask!